Born in Osaka. 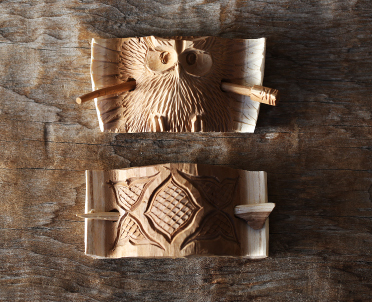 He moved to Hokkaido at the age of 19, worked under Tadashi Kaizawa deputy chairman of the former Hokkaido Utari Association, and started woodcarving at the age of 24. 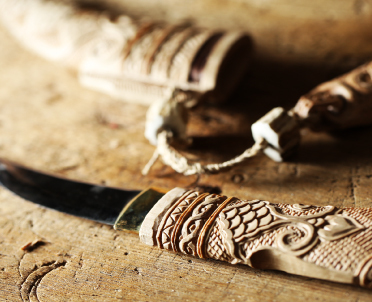 He fuses bold, powerful carving with delicate Ainu patterns to create works that are redolent of the unique world of Haruo Suzaki. 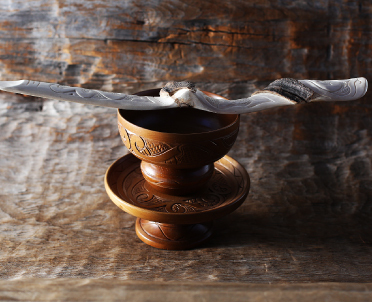 Particularly sublime are items such as the iku-supai (prayer stick) and tuki (cup), implements used to convey prayers to the kamuy (god). 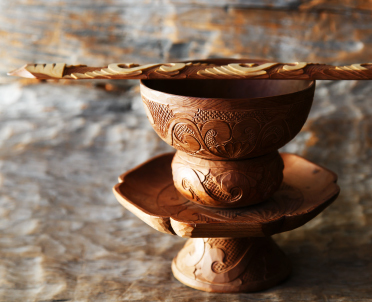 Also popular are his walnut coasters and nima (bowls), which bring out the beauty of the wood's grain. 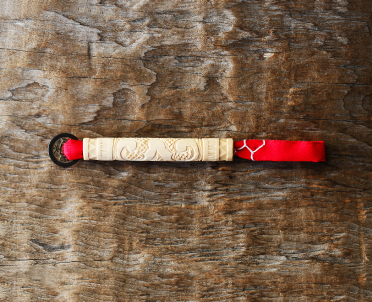 Haruo Suzaki's passsion for his craft imbues each one of his handmade implements. He grew up surrounded from childhood by the carvings produced by his woodcarver father Moriyuki (died in 1977). 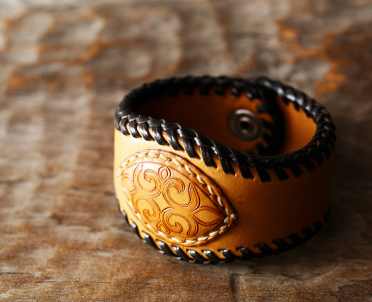 Mamoru was 12 when his father died and, although he did live in Sapporo for a while after graduating from high school, he returned to his home town at the age of 21, since when he has continued to create handicraft products. 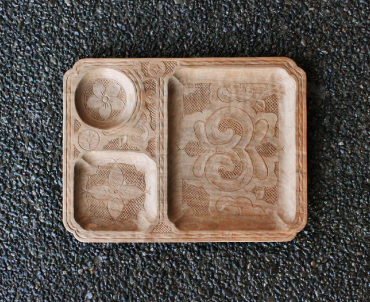 The profound techniques of past generations of craftsmen live on in the ita (trays) of Nibutani, and he pours his energies into creating original works whilst also trying to pass on that tradition. 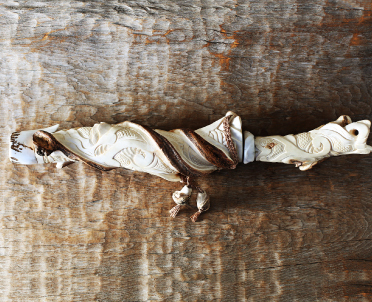 He is particularly noted for his delicately beautiful Ramuramunoka (fish-scale pattern) carvings, where he creates shading by inserting the chisel into the wood at an acute angle. 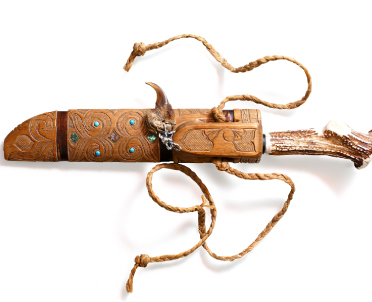 His leather goods embossed with Ainu patterns and mobile phone straps with owls carved out of antlers are also popular. In 2010 he was the only traditional Ainu craftsman selected from Hokkaido amongst the 80 people from all over Japan designated as "Masters of the Forests" in the cultural category of the National Land Afforestation Promotion Organization Contest: Traditions of the Forest. He is the owner of Kaizawa Mingei. He is well-known as an engraver of salmon and menoko (woman) bas reliefs and, while working on his own original creations, he works enthusiastically both in his home town of Nibutani and throughout Japan as the leading expert on cise construction. Even in Nibutani the techniques of cise construction had long been lost. Along with the late Shigeru Kayano, who devoted his life to promoting Ainu culture, he took part in cise construction in various different areas and learned the techniques and lore by experience. His dream is to build rows of cise in the grounds of the Nibutani museums and bring back the bustling vitality of the past. His activities are fueled by his pride in his home town and zeal to pass on traditions and train successors. Born in Tokyo. 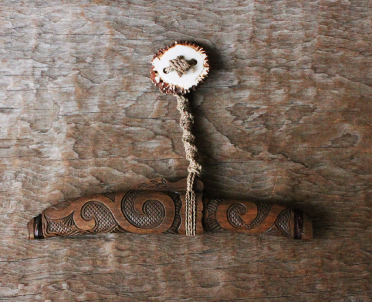 While travelling in his 20s he happened to drop by Nibutani and was fascinated by the beautiful woodcarvings. Drawn by the warmth of its people, he decided that this was where he wanted to live and moved to Nibutani. 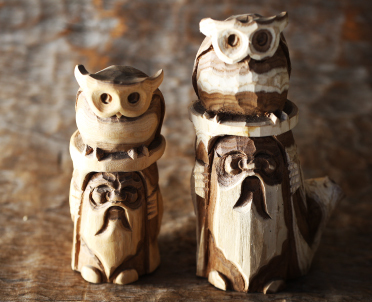 In 1972 he started to learn his craft from the woodcarver Moriyuki Kaizawa. 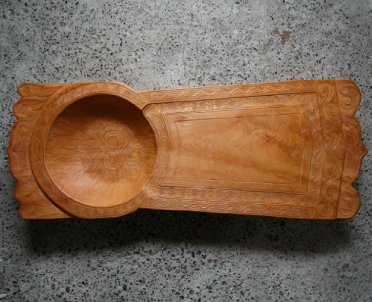 He finished his apprenticeship in 1979 and established Takano Mingei in 1980. 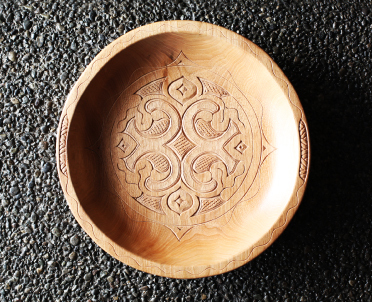 He is profoundly loyal to traditional Ainu handicrafts and designs, and devotes himself to producing ita (trays), nima (bowls) and makiri (knives) whilst studying the designs of skilled artisans. In particular, Shigehiro Takano is the only person in Nibutani today who has mastered the precious techniques required to make the tonkori, a traditional five-stringed instrument that has been handed down in Ainu culture. 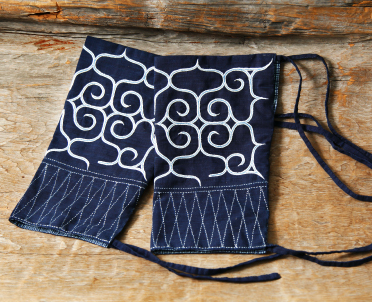 He holds solo exhibitions throughout Japan and works hard to publicize the charms of Ainu crafts. He has won many prizes, including the Governor's Award for Excellence at the All-Hokkaido Ainu Folk Crafts Contest. He is the owner of Takano Mingei. She has more than 50 years of experience in weaving attus. She dyes the attus made from lobed elm bark with flowers and plants that grow locally like marigolds, madders and walnuts. 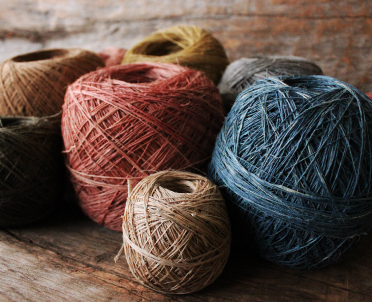 The yarn stiffens when it is dyed and is hard to weave, but she continues to take up the challenge, saying that "it's more satisfying when it's difficult". 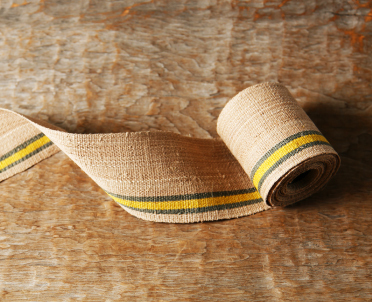 Orders flood in from all over Japan for the beautiful striped obi belts, bags and purses she makes with pale-hued yarn.She sometimes works more than 12 hours a day but says, "it's no hardship because I love weaving". 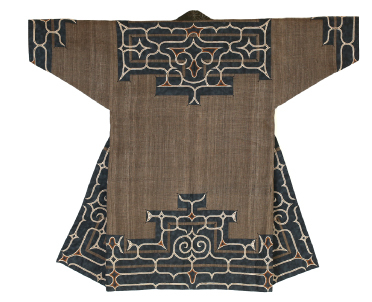 The more she weaves, the more she wants to create good items, and she always says that it is "life-long study".She was also recognized as "an excellent craftswoman" by The Ainu Association of Hokkaido in 2011 and has won many awards.She is vigorously engaged in transmitting and preserving Ainu culture, and in training the next generation of artisans. 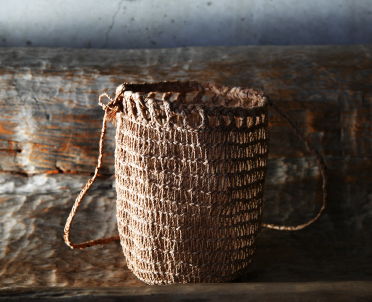 She is a practitioner of traditional attus (textiles woven from tree bark fibers) techniques, few of whom remain even in Nibutani. 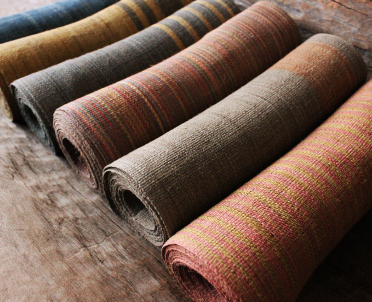 During her childhood these textiles were woven in every Nibutani household, so she helped her mother to make the yarn from an early age. She started to weave in earnest when she was in her third year at junior high school and took over the task of weaving when her mother was hospitalized. 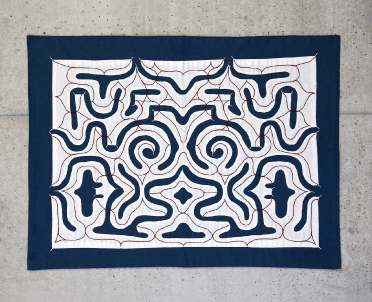 She was taught about Ainu patterns by Shigeru Kayano's wife Reiko. 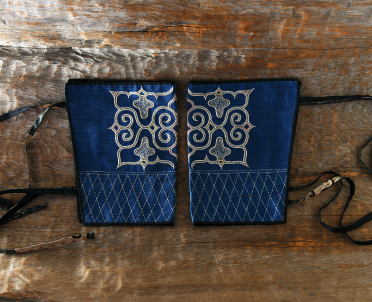 Her clothing, bags and other accessories made of attus textiles with their unique texture and hues are very popular, as are items such her carefully embroidered brightly-colored coasters. In 1967 she married the woodcarver Noriyuki Fujiya. Since Noriyuki's death in 2007 she has devoted her energies to mentoring the next generation in Nibutani as a vocational training instructor (in weaving and textiles). She has won many awards, including Hokkaido Utari Association Chairman's Award at the Hokkaido Ainu Traditional Craft Exhibition. 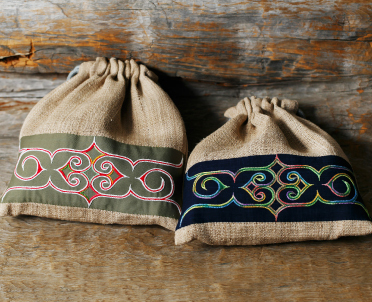 She came into contact with Ainu culture and crafts via her grandparents' generation while she was growing up, and her natural fascination led to her acquiring such skills as woodcarving, attus weaving and Ainu pattern embroidery. She wants as many people as possible to understand how fascinating Ainu culture is, and is an all-rounder who turns her hand to a wide range of works. She often creates her works in front of the customer and so produces original creations that accord with the customer's image or requests. 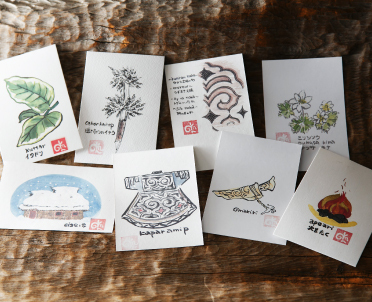 She adds new twists while basing her works on traditional patterns and techniques, and energetically throws herself into creating items such as items for casual daily use and distinctive postcards, for example. 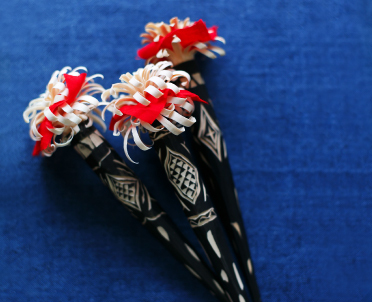 She also actively publicizes Nibutani to make its culture known throughout Japan and the rest of the world and connect it up with future generations, conveying such aspects as the artisans' wishes and the difficulties of the creative process. She says, "Ainu culture is based on love for the family. It would make me happy if works imbued with that sentiment bring feelings of happiness and joy to many people." She has been actively involved in creating craft items in Nibutani since 1970, along with her husband, the late Fukuji Kaizawa. 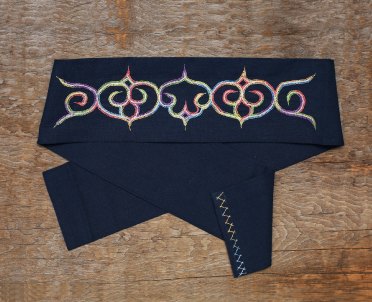 In addition to kimono and hanten short coats embroidered with Ainu patterns, she also makes small items such as amulets, mobile phone straps , bracelets and attus textiles. She loses track of time as, engrossed in her work, she carefully creates each item while praying for the happiness of the person who will use it. 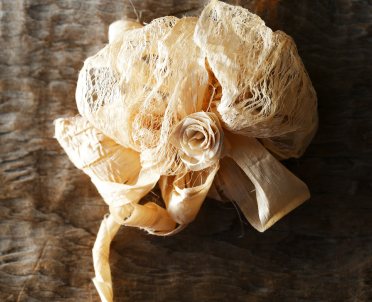 Particularly popular are the amulets of cloth-wrapped ikema root (Cynanchum caudatum), a plant that from ancient times has been part of Ainu daily life as a protection from evil. There is warmth in the color combination of the cloth and stones she uses, and they soothe the minds of the people who hold them. Fukuchan Mingei is the shop that she ran with her husband, and it also displays and sells his woodcarvings (nipopo dolls, owls, nima bowls, hair slides, and so on). 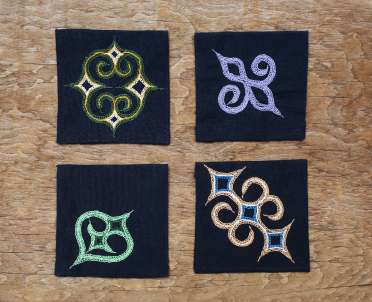 She embroiders traditional Ainu patterns, focusing intently on carefully completing each individual stitch so that each chainstitch is exactly the same size. 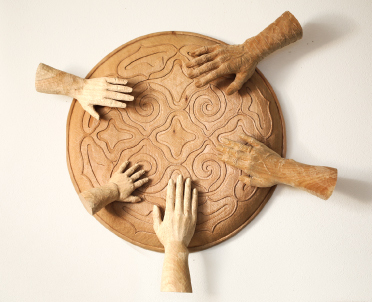 She is also meticulous in the beautiful finish that she gives to the corners, known as kirau, and visitors are fascinated by the level of perfection of her painstakingly crafted works. 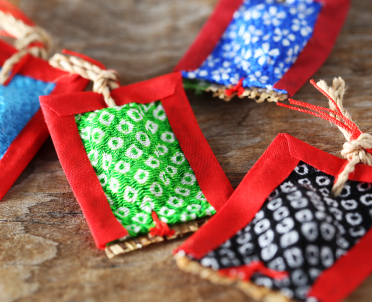 When she makes kimono she attaches a cloth with a pattern called kirifuse and embroiders over that. She enjoys the process as the pattern takes shape and becomes engrossed in her work, losing all track of time. 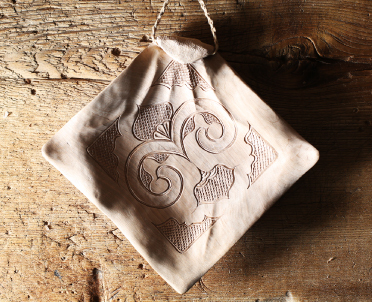 Small items such as her coasters, luncheon mats and pouches, sewn with brightly-colored thread, are also popular. It delights her that the people who select them will value them and use them well. She was awarded an Honorable Mention by the Hokkaido Utari Association at the Hokkaido Ainu Traditional Craft Exhibition for a karakarape (kimono) on which she worked for seven months. Copyright © Biratori-cho All rights reserved.